December is always a little too full for me to spend a lot of time reflecting on the upcoming year. I've spent much of this month considering the areas of my life that need a reset. I'm slowing down and thoroughly thinking through my goals and aspirations for 2018. I often resist the conceptual idea one has to make goals only in January. We can make small changes any time of the year, but with that said, one area in my life that immediately called for a reset is my skin! I've been on a skincare journey for several months and am finally experiencing results. Yay! I know I'm not the only one who finds acne and acne scars embarrassing. Thankfully, ever since my perioral dermatitis diagnosis in October my skin has started to heal. I credit my simple and effective skincare routine, but after the indulgence of the holidays my routine needed something more. Step One:Olay Daily Facials. 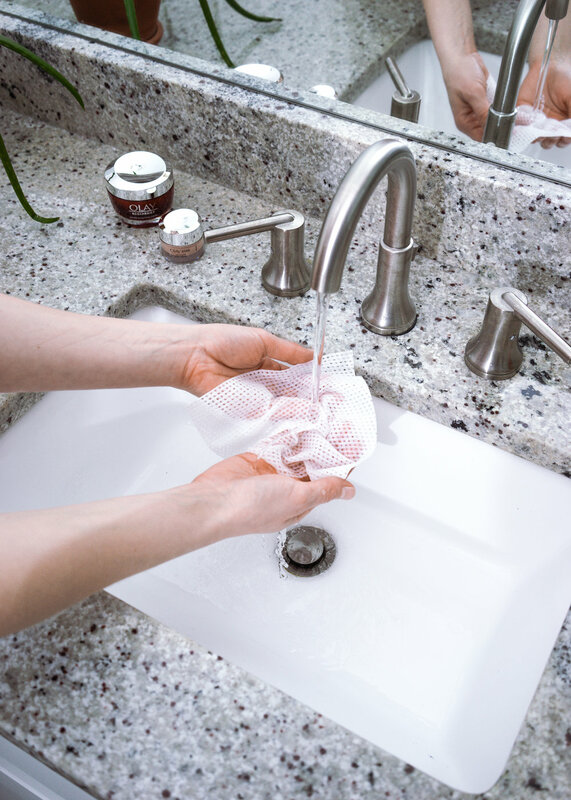 The 5-in-1 cleansing cloths deliver a more complete clean than the leading makeup remover, micellar water or liquid cleanser. The cloths do everything! They remove makeup, cleanse, exfoliate and hydrate with no residue left behind. I wanted to find a way to reintroduce gentle exfoliation into my skincare routine and Olay's Daily Facials are perfect. With my perioral dermatitis diagnosis I stopped exfoliating. The cloths are gentle, but my skin is still benefiting. Step Two:Olay Regenerist Micro Sculpting Cream. It reduces the appearance of fine lines, immediately plumps the skin and hydrates better than high cost creams! Sometimes I have trouble with moisturizers not sinking into my skin fast enough. I don't have time in the morning to wait around to apply my makeup, but I don't have that problem with the micro sculpting cream. Even its thicker formula sinks in immediately. Step Three:Olay Eyes Ultimate Eye Cream. The eye cream reduces puffiness and the appearance of fine lines and dark circles. I love that the eye cream is slightly tinted, so it acts as a color corrector for my dark under eye circles. And since starting to use the eye cream, I haven't had to use as much concealer. Win-win! To join me in your own skincare reset, click here to purchase everything you'll need for Olay's 3-Step Reset! I'd love to hear what resets you are making in your own life.